Ruby Silvious is a visual artist and graphic designer who prides herself as a recycle artist. She uses everyday objects such as pistachio shells, egg shells, paints chips and the likes as canvases. Breathing life into used materials and turning mundane objects into the extraordinary, her art is exhibited internationally, and featured in public and private collections. Currently living in New York, she was born in Tacloban City, Philippines and immigrated to the United States when she was 20. Her education and wellsprings of inspiration spans three continents with continued fine arts education in New York City, and a summer learning printmaking at the Il Bison per lo Studio della Grafica d’Arte in Florence, Italy where Picasso printed his sole lithography made in Italy. 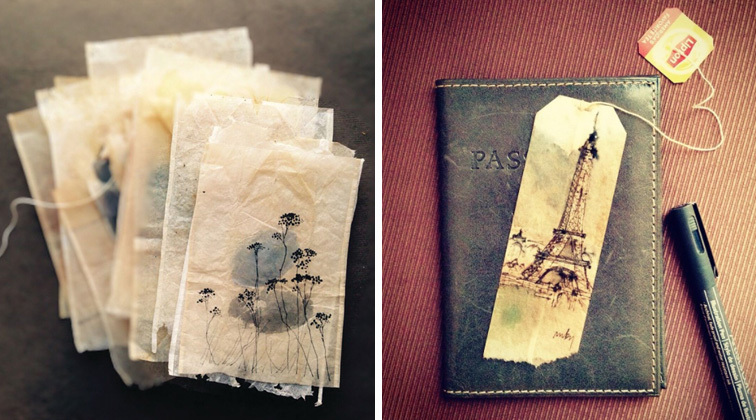 In 2015, she embarked on a visual journal called 363 Days of Tea to record her impression of the moment using used tea bags as her canvas. Explaining the reason behind the medium, Ruby explained that the bag’s size and different stains is an endless source of inspiration. As a sign of modern times where instant gratification is valued, the smaller the canvas also allows for faster completion of a piece in a few hours and shared quicker with the world. As to why it’s 363 days instead of 365, Ruby has a more mundane explanation. She didn’t start the series until the third day of January 2015. “I like that it’s not too trite. It was easier to find a domain with the missing two days,” she said.